“The thing about Bibi is, he’s a chickenshit.” Who made that disgusting observation? We may never know…but it was someone in the Obama White House. 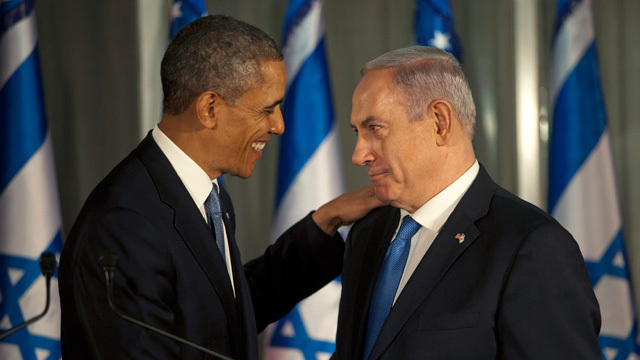 Given the president’s repeated shunning of Prime Minister Netanyahu and frequent shows of disrespect for Israel in general, I honestly wouldn’t be surprised if it was Obama himself who delivered the remark. But whoever it was, columnist Jeffrey Goldberg of The Atlantic isn’t telling. In a piece published on Tuesday, Goldberg goes into great detail about how the relationship between Obama and Bibi “is now the worst it’s ever been, and it stands to get significantly worse after the November midterm elections.” He even predicts that Obama could withdraw diplomatic cover for Israel at the UN by next year. Goldberg adds that “Another manifestation of his chicken-shittedness, in the view of Obama administration officials, is his near-pathological desire for career-preservation.” The gloves are definitely off, even if this unnamed “senior official” in the Obama administration chooses to remain anonymous. But it sure is amazing watching the once close relationship between America and Israel virtually disintegrate over a matter of years, mostly out of our president’s own narcissism. I mean, honestly…”chickenshit”? Netanyahu has had to make some of the most difficult decisions a country could possibly make in order to defend itself and preserve its own future. Those decisions have been deadly, but necessary. Meanwhile, we have a Commander-in-Chief who wants to fight all of his wars from the air and never get a single boot dirty. But Bibi’s the chickenshit one? You know what’s really chickenshit? People who grant “anonymous” interviews to reporters and cast aspersions. And if it happened to have been Obama delivering the remarks anonymously as some sort of passive-aggressive way to communicate the administration’s frustrations with the Israeli Prime Minister, well then…that’s REALLY chickenshit. I’d have guessed Joe Biden here, but he’d probably have been just careless enough to make the remarks on the record. Next Story → Wait, Obama Wants To Do WHAT With Overseas Ebola Patients?